As I was a student of all things military, and the centennial of that great blood-letting had just passed, I was keen to join. Mom and Dad had heard of this reenacting thing and immediately had visions of lots of money going towards this particular hobby. But, my friends assured them that the firearms were provided, as was some of the equipment, all that the parental units needed to provide was clothing. Alas, while I had envisioned uniforms like those in the opening photo, 'twas not to be. For, and I am ashamed to say this, we were "farbs." (Which regardless of what the link states, I've always maintained that the word derives from the German for color, i.e., Farbe. Once this kitting out had occurred, I went to my first "muster" of my new unit. We were apparently reenacting the 9th Vermont Infantry, the real soldiers of that unit would no doubt be aghast at our clothing (though it was far more comfortable and rugged than the stuff worn in the 1860s, Hell, it was better than some of the "Made in China" crap that's sold now, but I digress) and our youth. The average age, as I recall, was 'round about thirteen. We had two old farts in charge, as I look back on it, they were both kinda sorta backwoods knuckleheads, but I'll get to that later. We marched back and forth a bit, were issued our rifles, kepis, belts (with US belt buckles) and cap and cartridge boxes. (The cap box was a small affair worn on the belt which held the percussion caps needed to fire the weapon, while the cartridge box was slung over the shoulder to hang at the right hip.) Other than the uniforms, we didn't look half bad. But farbs we were, there's no mistaking it. A few days after I had "joined up," the word came down that the unit would be going to Gettysburg, for to stem the Rebel invasion, er, for to participate in a battle reenactment. "Gee Mom and Dad, all my friends are going." was my plea. "Well, I'll speak to the head knucklehead about it." sayeth my dear old Dad. Words were exchanged, permission was given, and after much wailing, gnashing of teeth, and rending of garments, Mother consented to her oldest young'un heading off to faux war. Anyhoo. We were on the road, it would take two days as much of the Eisenhower Interstate System was still being built. Even with the interstate I doubt that old bus could make the trip in less than two days. The first day's trip ended on a little farm just outside Binghamton, New York. The leader of our merry band, we happy few, went up to the farmhouse and con permiso "might me and the boys camp out here on your front lawn?" "Really? What if I offered you a few bucks?" "Well, you can park the bus right there on the road to the barn. But keep your misfits off the lawn!" So Chief Knucklehead (CK) returned to our chariot and asked the lads to pony up a buck a head so that he could pay the inhospitable harpy, er, farm lady so that we might bide a while on her dirt road. Amidst much grumbling each of us handed over a bit from our limited stash of ducats and watched as CK returned to the farmhouse, cap in hand, and forked over the extortion money, er, "lodging fee." So into town we went. Found a Friendly's Restaurant right away, well, after walking the better part of a mile, and went on in to get some grub. Satiated, we were having rather too much post meal fun, and were, somewhat politely, asked to depart the premises. To which one of my compatriots commented, "Well, it isn't all that friendly here, is it? You should change the name of the place to..."
Off we went, back to our roadside caravanserai where, it now being dark, we boarded the bus and attempted to catch 20 winks. But it was hot and humid, and the mosquitoes were having a field day supping on our blood. It was too damned hot to try and sleep on that bus, sitting up, so off we got and proceeded to lie upon the earth with naught but a single blanket to cover us. CK yelled at us to stay off the lawn. With a few muttered "go fire truck yourself" from the lads, we ignored CK and tried to sleep. Well, dontcha know it but him and KN2 both got off the bus and joined us on the grass. Where, with a rumble of thunder, it began to rain. Heavily. Looking about, a few of us got under the bus. Where the downpour was lessened and the flashing lightning and thunder could be semi-ignored. Well, except for all the water running down the ruts of that dirt road out to the barn, we were somewhat sheltered. And there was enough room between the wheel ruts for most of us to stretch out and visit the land of Nod, however briefly. For it didn't seem that long before CK and KN2 got us up and back on the bus. Bright and early it was, seems that our presence on that little farm was no longer welcomed. Seems that CK and KN2 had been up to the farmhouse, begging for a cup of coffee, and had been unceremoniously "sent off." Shotguns may or may not have been involved, I can't really say. So back on the road we were, driving to the sound of the guns as it were. On the road to Gettysburg. However did kids survive in those days(sarcasm in the air)? Imagine this happening nowadays..... with social media?!? The HORROR! CK and CK2 would be brought up on charges along with the parents. Am eagerly awaiting part two. Yeah, the things that went on back in the day. Yet most of us survived to adulthood, heck, most of us thrived! Obviously you were on the wrong side. Had you been in Confederate country you would have been greeted with open arms. Why bless your heart, of course you all can camp here. We're just fixen supper, won't you and the boys join us? And we'll be glad to feed you coffee and bisquets with sausage gravy and for breakfast in the mornin. And you tell Genl Lee we said bless his heart. And how did you get a peek at a later installment? Seriously, while down in Pennsylvania we had some southern hospitality from an unlikely source. One of the reasons why the 9th Vermont became the 10th Mississippi. But that's a story for a different time. I like it, "future gumbo of horror story," has a certain je ne sais quoi about it. Hey Dave, I can tell you, you aren't far from the truth. Coming from a family that suffered total loss at the hands of the benevolence of the Northern Army, we always had food for the weary traveler. Mom and dad both had stories about hospitality. There are some things which aren't forgotten. Johnny Reb torched my family's stuff in Chambersburg, so even stevens? Yup. Can join both groups, from folk from Louisiana and Ohio. Because there's sooooooo much hatred between the South and the North still... not. I am the great-grandson of a Union veteran, don't think we had anybody south of the Mason-Dixon line. But truth be told, I'm sure both groups are very much like the DAR, snobby and elitist. Then again, might be the New Englander in me, we tend to be contrarians. Yeah, that war STILL defines us. My kin were from Alabama, got land for service in the Revolution from the new government for services rendered. The original plat was in Georgia, made a good farm there, sold it, and moved to Alabama. My other branch were in Missouri when the unpleasantness started. Lived in the same area as the James brothers, was paroled from an Ohio prison camp (doubtless a Hilton Inn with room service), and walked all the way back home. Packed up and went to Texas.... Same with the Alabama group. After their land was reissued to the newly arrived settlers, they packed up and moved to Texas. Life was tough back then. I don't want any reparations, or sympathy. It's just that the word civil must've had a different meaning back then. But I learned a lot from the children of those old war veterans. Hospitality was very important, as was manners. Speaking solely as a member of my family, it was so ingrained in us as kids, that muttering "fire truck" under your breath, especially at an adult, made you feel guilty for a week. I hurt myself when I was about 13 and said, "crap!" out loud. Mom turned and said, "You have something in your mouth I wouldn't care to hold in my hand." I felt like she it me in the face with a wet baby diaper. Southern manners! From what I hear, they are just like any other fraternal organization, like the Moose Lodge, or the Masons, etc. Some groups are more snobby and elitist than others. And it's not just us Americans. There are Japanese groups that you can't join if you're not from the right village or family heritage, that re-create the shogunate wars. Though, so far, no groups recreating the Bolshevik revolution exist, openly, yet. STxAR - There is still a certain something about the South which distinguishes it from the North, and manners is a HUGE part of that difference. I love Virginia, love visiting there. One of these days I will bend your ears with the story of how Darling Husband introduced myself and Darling Child to reenacting. Suffice it to say here that DH was definitely into doing things correctly (woe betide that we should EVER be labelled as Farby)...we weren't allowed to take a single item with us that would not have been found back in the 1860s (we even had to sleep on straw).....but, despite the rough beginning, I love the hobby (and the hubby)! I am a seamstress by trade and can make anything if I can see it.....so making accurate uniforms, clothing etc is my trade. It's certainly been an eye opener that's for sure. My very first reenactment, it rained cats and dogs all weekend. Most of us hung out under the only dry place (the embalmers fly...who just happened to be a lady)and listened to the guys recite Monty Python Holy Grail almost word for word. We laughed ourselves silly and had the best time despite being very wet (and I had a million crickets up under my hoop, very disconcerting). Loved the story and can't wait for part 2!! A lady who has "been there, done that." Awesome! MPandtheHG seems to be a requirement for the reenactor/recreator. Secret password. Almost our (collective our) version of... Rocky Horror Picture Show. If I went ’round sayin’ I was Emperor, just because some moistened bint lobbed a scimitar at me, they’d put me away! If you squinted hard enough at the bus and called it a wagon, I'd say you had a very accurate first experience of the War of Northern Aggression. Wet, muddy, lousy food, no sleep, long days, cold nights, bugs and so on. Glad it made a profound impression on you, historical interest wise. Looking forward to Part deux! True, though you forgot the "early in the war idiot commanders" the North was so fond of, like "Brains" Halleck. If he'd been an aviator you know what kind of callsign that was! Yeah, we had that too. I looked into CivWar reenactment around 1985ish. By then, if your kit wasn't strack, you couldn't play at their enactments. Farbies only when practicing, thank you. At least in my area. In the mid-80s I was doing WWII reenacting. Rather than going into the USAF in 1975, I had toyed with the idea of joining the 23rd Foot, Royal Welsh Fusiliers. But then I looked at how much that cost, whereas the USAF actually would give you everything you needed, plus pay you twice a month. I've heard, from the actual reenactors themselves, about people not being able to play on the field due to wrong buttons, like the buttons on a jacket or coat are 1 year out of date. From Civ War, WWI and WWII reenactors. 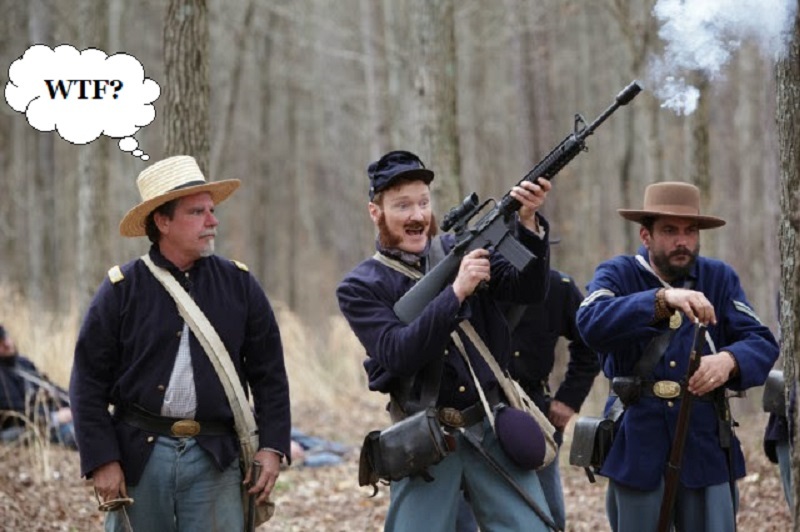 Reenacting isn't what it used to be. Fortunately never ran into many of those. Did know a guy in my WWII circle (a rather contentious Fallschirmjäger) who bemoaned the "inaccuracy" of my unit's uniforms despite all of the photographic evidence our unit commander (a retired U.S. Army infantry major) produced. This guy, who would bring his Volkswagen Thing to reenactments saying it was "close enough" to a Kübelwagen to be just fine (if one employed the 1000 meter rule). As we were doing an SS-Verfügungstruppe unit formed to fight exclusively on the Eastern Front, the guy had no clue as to what he was talking about. An actual veteran of those times (a German) said our uniforms were pretty damned close to what he remembered. "They'll argue all day long about a proper button but couldn't tell you the historical circumstances of any particular engagement."